Green tea is a healthy, refreshing and hydrating drink that you can enjoy hot or cold. Green tea contains antioxidants that help to improve brain health, prevent chronic disease, and boost your cardiovascular health. You can also use green tea to help lose weight and improve your health at the same time. 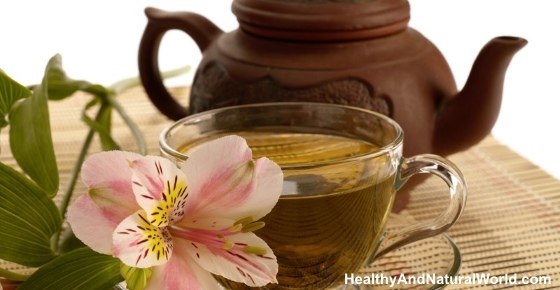 The health benefits of green tea also include using it to improve your skin tone. Green tea contains compounds that are great for keeping your skin healthy and looking fresh. You can also use green tea to help treat acne prone skin and assist in reducing the appearance of pimples. In this article, I will examine what scientific research has revealed as to the true health benefits of green tea. You will also find out if science backs up claims on using green tea to lose weight. You will also learn how to use green tea as a cleansing toner for your skin. Green tea comes from the tea plant Camellia sinensis. Native to East, South and Southeast Asia, but these days cultivated across the world in tropical and subtropical regions for its many wonderful properties. Tea leaves from Camellia sinensis are used to make green tea, black tea, white tea, and oolong tea. Starting your day with a freshly brewed cup of green tea is a great way to start the day as it can boost your metabolism and give you more energy. Most of the health benefits of drinking green tea come from its high levels of antioxidants. Researchers have noted that it is not just one antioxidant in green tea that is beneficial. The health-promoting effects of green tea are due to a “synergistic” effect that is the combination of many antioxidant compounds. Let’s look in more detail at the many ways you can use green tea to boost your health and make your skin look better. Green tea extracts and natural green tea have the potential to help you lose weight quicker and boost your metabolism. There are 0 calories in a cup of green tea without any additive (such as milk or sugar) so it’s a great hydrating drink. Much research has been done on the fat-burning potential of green tea extracts. Many people buy green tea supplements for weight loss or increase their daily intake of hot green tea. What does scientific research say about the effects of green tea on losing weight? You can boost the weight loss properties of green tea by adding some lemon juice to your tea. There are some scientific studies about using lemon juice for weight loss. The antioxidants in green tea benefit your skin, help prevent the appearance of fine lines and have anti aging effect. In fact, there is evidence to support the fact that consuming green tea, taking green tea supplements, and using green tea topically can all benefit your skin. Find out other effective homemade face masks for acne. If you want to improve the appearance of your skin using green tea, here is an easy way to make your own green tea facial toner at home. Put 2 tbsp. loose green tea leaves or 1 green tea bag in a cup of boiling water. Cover and allow to infuse for 3 to 5 minutes. Strain the tea into a glass container that is sealable and allow to cool. Dip a clean cotton ball into the green tea toner and use to gently cleanse your skin. Leave to dry. You don’t need to rinse the green tea toner off your skin. The green tea skin toner will keep in the refrigerator for 3 days. Always remember to use a clean cotton ball and avoid “re-dipping” a used cotton ball in the toner mixture. Green tea is good to drink every day because it contains antioxidants that boost your cardiac health. Find out what other simple habits can help improve your heart health as well as drinking green tea regularly. One of the reasons why drinking green tea is good for you and your cardio health is that it helps lower cholesterol. Did you know that you can also drink apple cider vinegar to help lower cholesterol? Polyphenols in green tea also have a positive effect on blood pressure and can help to lower hypertension (high blood pressure). Learn about other practical steps you can take to get your blood pressure down without drugs. Green tea doesn’t make you sleepy but can still have a calming effect on your mind. Researchers also found that matcha tea (also called Japanese green tea) has an even better effect on the brain than green tea. This is because matcha tea contains higher proportions of phytochemicals than green tea. (16) You can find out more about the health benefits of matcha tea. Find out what you can do if you have depression to treat your symptoms naturally. Because amino acids and enzymes in green tea have a beneficial effect on brain health, green tea can help prevent certain neurodegenerative diseases. Learn about other supplements that may help prevent Alzheimer’s disease because of their benefit to your brain health. Regularly drinking unsweetened green tea can benefit you if you suffer from diabetes. Green tea is just one of the many foods to control type 2 diabetes that you can incorporate into your diet. Extracts from green tea contain antioxidants that have shown to have anticancer properties. Did you know that green tea is just one of the many foods with cancer-fighting properties? The antimicrobial effect of green tea can help to reduce levels of oral bacteria and prevent dental problems. Find out how you can remove plaque naturally and how to get rid of gum infection naturally. Increasing your daily intake of green tea has many health benefits. The high levels of antioxidants in green tea can help reduce your risk of cardiovascular disease, certain cancers, and degenerative brain disease. From reviewing many studies, it would seem that the healthiest way to drink green tea would be to consume around 5 cups a day. Drinking a cup of green tea every 2 or 3 hours during the day should help to keep you mentally alert and prevent fatigue during the day. Remember that green tea doesn’t make you feel sleepy, so you may want to avoid drinking green tea a few hours before going to bed. So, depending on the strength of the green tea, you shouldn’t exceed between 7 and 10 cups of green tea per day. Green tea from the Camellia sinensis plant is generally safe for adults to drink in moderate amounts. It’s important to remember that green tea contains caffeine and consuming large amounts of caffeine can bring on feelings of anxiety and possibly headaches. Can I get the same benefits with bottled beverages(green tea) in convenient stores like C2? Hi Ian, you need to read the label to see if it’s 100% natural green tea. Sometimes commercial bottled green tea can contain other ingredients such as artificial sweeteners or a lot of sugar or other additives. I think maybe the safest option would be to steep and bottle the green tea yourself so you know what goes into it. Thanks for d info i enjoy green tea. Is it advisable for a pregnant woman to be drinking green tea? Looks like İ’m late to this party on here. I’ve only recently come across this blog and I saw this post about Green Tea. I think drinking green tea has definitely become more popular over the years. You can now get green tea or herbal teas in any restaurant or coffee shop. It’s great for people to read this post and see that green tea does have it’s benefits. All the benefits you have listed are these just for the pure green tea as you can get some green tea with hints of lemon or mint. Will they still give the same benefits? Hi Adam, I guess it depends on the amount of green tea in the flavored one – is it the same amount of green tea like the pure one with added ingredients (lemon or mint), or is there less amount of green tea in the mixture because of adding lemon or mint – I guess it depends on the tea brand that you buy. In any case, it’s better to drink even a smaller amount of green tea than not drinking it at all. Also you can always buy pure green tea and flavor it yourself with lemon or mint. Thanks for the reply. That’s a great point made I have never really thought to check how much green tea is actually in the flavoured ones. When I have bought it, it’s always said on the packaging green tea with lemon or green tea with mint. I might try getting pure green tea and adding in my own slices of lemon or fresh mint so I a getting the full benefit of green tea. should we add sugar in green tea ? There are better natural alternatives to sugar as a sweetener. Read about them in my article 5 Best Natural Sugar Substitutes. No. But if you like it sweet, a spoon of honey would do good. No,it eliminates some of the health benefits! I have loved all kinds of green tea since living in China for 14 years. However, my doctor in U.K. says that my urinary incontinence is due to the high caffeine levels in my daily green tea consumption and has advised me to switch to Rooibos instead. I really miss my green tea! I am 65 and was drinking 6-8 cups of green tea a day. I like it weak and used only two teaspoons of tea leaves per day. What do you think? Urinary incontinence can be caused by certain drinks that may act as diuretics, and these include drinks with caffeine (see Mayo Clinic). However there can be many other causes of urinary incontinence, such as changes with age, enlarges prostate, medications and more. Therefore a thorough evaluation by your doctor is needed to determine the cause of your incontinence, and this is something beyond my ability. It would be interesting to see if you switch to Rooibos tea if the problem continues or not (providing you drink the same amount of fluids). If the problem continues, then the cause probably lies somewhere else and you will need to go back to your doctor.